Awesome Friday! » Blog Archive Iron Fist Season One Review: I Don't Have A Good Pun To Tell You To Skip It (If You Haven't Decided To Already) - Awesome Friday! I finally finished watching the first season of Marvel’s latest Netflix series Iron Fist. Spoiler alert: it is not a good show. Look, I know I am late to the party on this but Iron Fist is really bad. It’s a misfires on almost every level, and might be the first truly bad thing to come out of the Marvel Cinematic Universe. Sure, there are movies that aren’t great and some of the shows are cheesy and weird, but Iron Fist is just plain bad, there’s no getting around it. 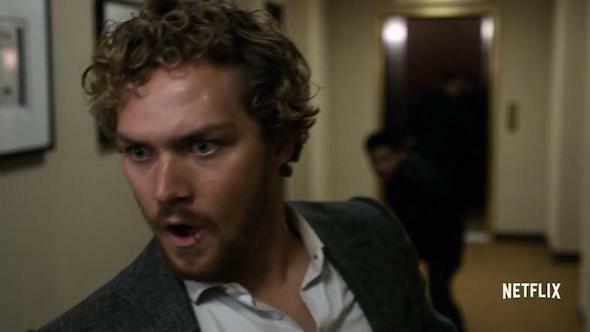 The basic story is that rich white kid Danny Rand is in a plane crash in China. He wakes up to find himself rescued by monks from a mystical city, K’un-Lun, which is then cut off from the world for the next fifteen years. He spends those years mastering Kung Fu, and attaining the supernatural ability to turn his fist into an LED Lightbulb focus his chi into his fist, rending it both extraordinarily strong and durable. There’s a whole conversation about representation and the co-opting of Asian culture to be had here, but suffice to say that the show had a unique opportunity and totally blew it. They could have done something new and different, maybe approach the “white guy becomes the best at Kung Fu” angle differently, or re-cast the role with an Asian actor, or anything, but instead they decided to change very little and the shows roots in 70s Orientalism shows through terribly. Not only that, if they are going to tell the story of a guy who goes to China and becomes the best at Kung Fu then maybe they should have put more effort into making show star Finn Jones a more convincing martial artist. Without hyperbole, there is no single fight in this entire show where both you can clearly see that it is him and it is a fun, enjoyable scene. I’ve read that they were teaching fight choreography just minutes ahead of filming in some instances and I almost think it would have turned out better if they just winged it. If they were worse they might at least have some comedic value. To add insult to injury, later in the show Sacha Dhawan shows up as Davos, Danny Rand’s childhood friend from K’un-Lun, and he does a much better job in all his fight scenes, to the point where I wondered why the monks didn’t just make him the Iron Fist. In addition to no work going into the fights it seems Finn Jones didn’t put much effort into the acting side of things either. To be fair, it doesn’t help that the character is poorly written. Danny Rand is either a genius or a moron, super naïve or incredibly savvy, all depending on what any given scene requires and without any real consistency. That can’t be easy to work with, but Jones has no presence to counteract it either. In fact, Danny Rand is not a likeable guy, he is entitled and whiny and I found it legitimately hard to root for him. There are a few bright spots here and there. Jessica Henwick has some real charisma as Colleen Wing. David Wenham has some delightfully over the top moments as one of the shows bad guys Harold Meachum. Tom Pelphrey seems to have raised acting exasperated into a new art form as Danny’s childhood friend, Ward. Rosario Dawson’s Claire Temple shows up and steals most of her scenes, but even she is stuck with alternating between being the only one reacting to things the way any sane person would and hopping on a plane to china to be part of the plot because… reasons. I know that Marvel TV is averse to spending money, they don’t do long dark hallway fights just for ambiance they do them because it’s easier to hide the fact that they are using stunt doubles. At some point though they’re going to have to put enough money up to film a fight scene in the daytime with one of these shows stars, or at least put some money into the effects. It really bugs me that the Iron Fist effect is just “his hand lights up”. In the comics his hand is surrounded by a field of crackling energy and that could have been spectacular, but instead it just looks like a lightbulb and that’s boring. And that’s really the main problem here: the show feels cheap and phoned in. The first half of the 13 episodes could probably have been reduced to two or three, and like Luke Cage they even set themselves up for some great standalone episodes and then ignored the opportunity. Once the plot gets going we’re still saddled with the fact that Danny Rand isn’t a likeable character, and when they try to do anything interesting there are almost no original ideas. Davos’s character arc in Iron Fist is exactly the same as Mordo in Doctor Strange. Colleen Wing’s story has exactly the same twist as Elektra’s in Daredevil‘s second season. There’s one fight in the middle that only seems to happen so that you know someone has seen Drunken Master, and another toward the end that makes sure you know that someone really liked the Hong Kong office tower sequence from The Dark Knight. Maybe there is a silver lining here. Marvel might learn from this and not make the same mistakes again. There’s even hope that if the show gets a second season they could course correct and make something special. I kinda doubt that will be the case, but it’s possible. Look, bottom line, Iron Fist is bad. I watched all 13 episodes and now you don’t have to. Do yourself a favour and read a synopsis online somewhere. Even if you are invested because you liked the earlier series and are looking forward to Defenders, just don’t do it. Hell, if you have started the series I’m here to tell you to stop. It doesn’t get any better.